I've made no secret of my distaste for Facebook's interface, which is equal parts messy, confusing, and outright maddening. For example, suppose you want to change your profile photo. Seems like the kind of option you might find in, say, Account Settings. Nope, not there. Privacy Settings? Nuh-uh. 1. Open your profile by clicking your name, either on the left side (below the Facebook logo) or the right edge of the toolbar up top. 2. 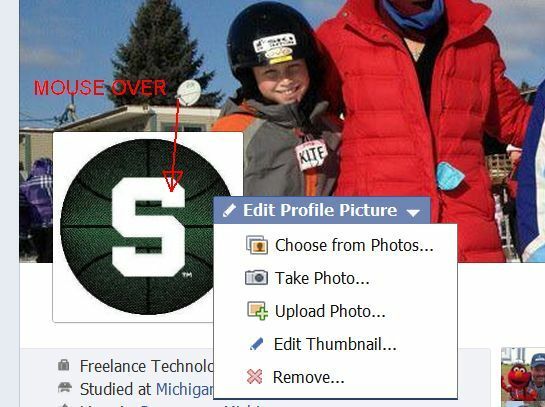 Mouse over your current photo picture, click Edit Profile Picture, then choose an option (Choose From Photos, Upload Photo, Edit Thumbnail, etc.) from the drop-down menu that appears. There is, admittedly, another way to go about this. If you want to turn a photo that's already in your Facebook library into your profile picture, you can--but, again, finding the option can be maddening unless you know where to look. Find the photo you want, then click it to bring up the full-size version in its own window. Now, see that tiny gear icon in the upper-right corner? Click it, and then choose Make Profile Picture. Why there's not a button for this alongside Tag Photo, Add Location, etc. is beyond me. Does this aggravate you as much as it does me? Or do you think I'm being overly harsh? Either way, share your thoughts in the comments! Contributing Editor Rick Broida writes about business and consumer technology. Ask for help with your PC hassles at hasslefree@pcworld.com, or try the treasure trove of helpful folks in the PC World Community Forums. Sign up to have the Hassle-Free PC newsletter e-mailed to you each week.